Scientists and some environmentalists believe nations might have to mimic volcanic gases as a last-ditch effort to protect Earth from extreme warming. The international panel charged with reining in climate change said this week that the world needs to take "unprecedented" steps to remake its energy, transportation and agriculture systems to avoid the worst effects of global warming. What the Intergovernmental Panel on Climate Change did not discuss was an even more radical potential response — one that would re-engineer Earth’s stratosphere to create a massive heat shield by effectively duplicating the fallout that follows a volcanic eruption. This kind of revolutionary “solar geoengineering” — known by some as the “Pinatubo Strategy,” after a volcano whose 1991 eruption shrouded the planet in a sulfurous cloud — was once relegated to a far corner of academia. But a number of scientists and environmental advocates said this week that the IPCC report — punctuated by Hurricane Michael, which hit the Florida panhandle and may have been intensified by global warming — argues for speeding up the study of the once unthinkable. That view was seconded this week by the “grandfather” of modern climate science, by the founder of the Harvard laboratory that is a center of geoengineering research and even by scientists who have raised serious reservations about human tampering with the Earth's singular climate system. “I think it makes sense to have a substantially larger research effort on solar geoengineering,” said David Keith, the professor of applied physics who leads Harvard’s Solar Geoengineering Research Program. Like others who have looked at the unusual alternative, Keith believes that humankind’s primary focus should be on reducing greenhouse gas emissions by cutting coal-powered energy, shifting to non-fossil-fuel burning vehicles, and many other changes. 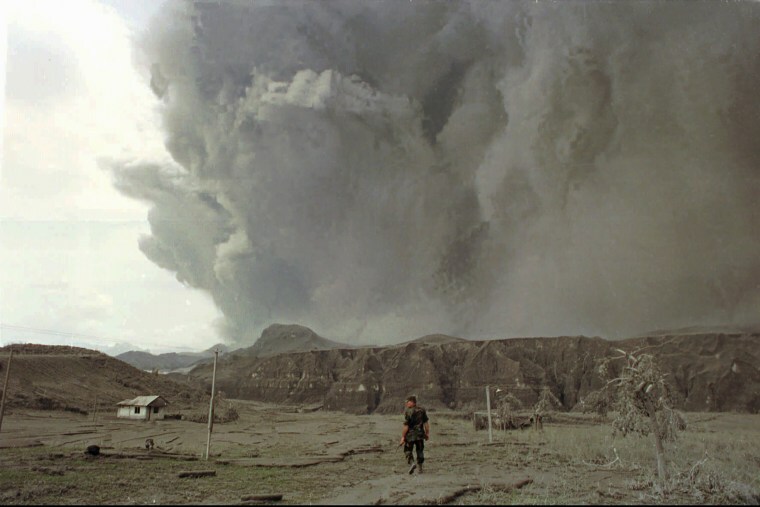 The climate intervention most commonly discussed by researchers grows out of observations made following two very large volcanic eruptions — at El Chichon in the Mexican state of Chiapas in 1982 and at Mount Pinatubo in the Philippines in 1991. In both cases, sulfur dioxide gas from the volcanoes spiraled into upper layers of the Earth’s atmosphere known as the stratosphere. There, the gas combined with hydrogen and produced the fine droplets or powder that scientists called “aerosols.” Those particles reflected enough sunlight back into space to cool Earth’s surface by 0.3 to 0.5 degrees Celsius (nearly 1 degree Fahrenheit). In the case of Pinatubo, the cooling lasted for about a year. Researchers have envisioned duplicating the phenomenon by launching jets equipped to fly to 70,000 feet, the lower reaches of the stratosphere, where they would release a sulfur compound. The effort would bleach blue skies a lighter color and make sunsets more vivid, while shielding Earth from some of the sun's rays. The National Center for Atmospheric Research, a nonprofit that is a leading climate research center, has run computer simulations that show such a program would cool the Earth’s surface. The cooling could reach 1 degree Celsius if Pinatubo-level sulfur injections could be duplicated continuously, said Simone Tilmes, a research scientist at the Boulder, Colorado-based center. Without endorsing or rejecting such a project, the National Academy of Sciences in 2015 recommended more research. The Obama administration also endorsed more study. So what are the potential drawbacks? Many, according to a list of 27 “concerns and risks” outlined by Robock in a 2016 paper that also concluded more research was needed. Among the potential downsides: depleting the ozone layer, failing to slow ocean acidification, slowing plant and crop growth, diminishing solar electric power and — among the most daunting concerns — triggering unexpected consequences. One unintended consequence of climate engineering might be the “moral hazard” of driving humanity away from the kind of deep-seated cultural, economic and political changes needed to put the planet on a more sustainable path, Robock wrote. Tilmes agreed that the work should proceed judiciously "in order to understand if this approach should be considered as an option in addition to large-scale mitigation. At this point, there are too many uncertainties to rely on [geoengineering] and more research is needed." Scientists in the field are nearly unanimous in believing that humanity must radically reduce the amount of carbon it pumps into the atmosphere to preserve the long-term livability of the planet. The IPCC report this week said that any temperature increase of more than 1.5 degrees Celsius (about 2.7 degrees Fahrenheit) will increase droughts, coastal flooding and destruction of critical natural habitats like coral reefs and Arctic permafrost. But progress toward that target remains painfully slow, said Wallace Broecker, a professor of geology at Columbia University’s Lamont-Doherty Earth Observatory. While not a preferred option, creating a shield for some of the sun’s heat could be a temporary solution that allows humankind time to reduce behaviors that are warming the planet, advocates say.